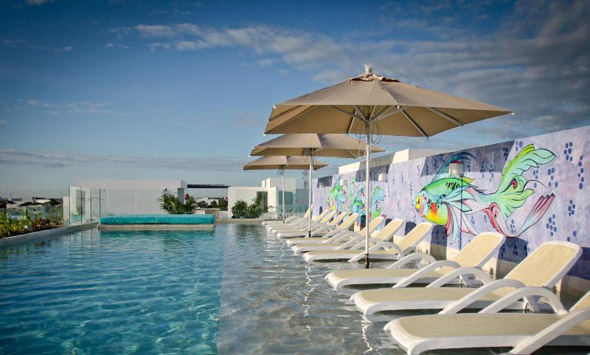 Interval International announced the addition of A-nah Suites Playa del Carmen in the Mexican Caribbean. The resort was built by Ricardo Montalvo, whose residential and commercial real estate development experience in Mexico spans more than a quarter century. The boutique resort includes 89 one- and two-bedroom units decorated in a fresh, bright contemporary style with light-wood accents. Each features an ample living and dining area, marble floors, fully equipped kitchens, bathrooms with modern finishes, flat-screen televisions, floor-to-ceiling glass doors and balconies or patios with views of a lush courtyard terrace. Among the various on-site amenities and services are the A-Nah Spa, hot tubs, rooftop swimming pool and bar, fitness center, children’s club and playground, private beach club, game room, outdoor cinema, complimentary Wi-Fi access, concierge services, housekeeping, and 24-hour room service. The town of Playa del Carmen has a cosmopolitan feel with pedestrian-friendly walkways lined with eclectic shops, galleries, cafes, and restaurants. Visitors can take sight-seeing trips to Mayan archaeological sites of Tulum, Coba, and Chichen Itza, and the island of Cozumel, which are easily accessible. Activities such as windsurfing, deep sea fishing, sailing, horseback riding, and golf are available in the area.